da Vinci 2.0 Duo features two extruders allowing you to create multi-Color projects using the 13 filament Colors available in easy-to-install cartridges. Join XYZprinting's global 3D design community, 3D Design Hub and Artist Collection, to create, share, and download over hundreds 3D designs from all over the world! XYZprinting designs CE certified printers with your safety in mind. Like its predecessor, the da Vinci 2.0 is fully-enclosed to protect not only you and your family from the heated extruders and print bed, but also protect your creations from accidental bumps and jars. The da Vinci 2.0 comes fully assembled and ready-to-go right out of the box with various useful tools such as automated nozzle cleaning and print bed detection for assisted leveling. 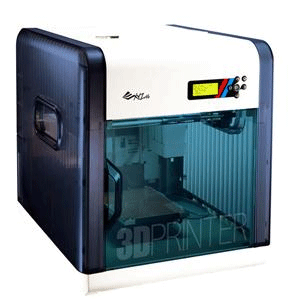 XYZprinting's da Vinci 2.0 is your choice for an easy, hassle-free, 3D printing experience. Dual extruder printers have never been this approachable ever! At XYZprinting, our 3D printers come with filament-detection technology and a simple cartridge slot system. You can now keep track of and quickly refill or replace your filament with ease! One-year, limited warranty with unlimited email and phone support when users register their products within 30 days of purchase (858-882-7555).